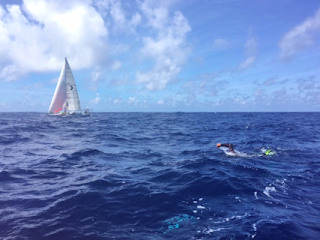 After the first 29 days of The Swim by Ben Lecomte, he has swum 469 nautical miles (869 km) off the coast of Japan. His planned 8,721 km transoceanic stage swim across the Pacific Ocean from Japan to California is nearly 10% finished after one month on the Pacific Ocean. Via satellite telephone, crew chief Paul Lecomte reported that marine life has been abundant: pods of whales, dolphins and turtles as well as jellyfish and sharks have been encountered on the swim. I very quickly lifted up my head out of the water and looked into the direction they were pointed. I couldn’t see anything. Maks told me it just past us about 50 meters behind us and kept on its course. They could see its fins and approximated its size to 2.5 meters, a good size. We stayed a couple of minutes at the same location and I tried to look below me for any sign of it, but I didn’t see anything, so I decided on resuming swimming. At hour 4, I started to experience some pain in my right ankle and removed my fins for a couple of hours to give them a rest. During those hours Lauren joined me for 2 hours. After that, I put my fins back on and didn’t feel any more pain. I swam almost until the sunset, our skipper Yoav [Nevo] asked us to stop to make sure we had enough light to come back on Seeker and secure the RHIB in place. Today the water was the warmest it had ever been."